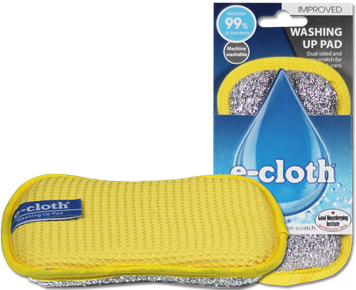 Win a Glass & Polishing Cloth, Kitchen Whizz and Washing Up Pad From e-cloth. With 480,000 fibres per cm2, e-cloths have enormous cleaning power, the fibres break up and remove more grease and dirt, incredibly using just water. Unlike conventional cloths, as you draw an e-cloth across a surface, the fibres clean by breaking up, trapping and absorbing dirt, grease and bacteria into the material, all this by just using water and an e-cloth! There's no need for expensive and time-consuming chemical sprays, just move from surface to surface with a water spray in one hand and e-cloth in the other. 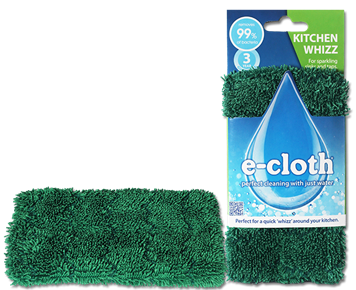 e-cloths have a 300 wash guarantee and by cleaning with just water, they reduce the need for household chemicals by up to 90%. The cloths significantly reduce the need for paper towels and wipes and by using high quality fibres, the construction of each cloth is specifically selected for the cloth's end use. They easily outperform and outlast traditional cloths and other cloths made with similar but lower quality fibres. e-cloth have very kindly teamed up with Unique Young Mum to offer one lucky reader/visitor the product's pictured above and detailed below worth £10.97. Your kitchen will be gleaming after this cloth is used, one of the original e-cloths, it absorbs moisture fast and flash-dries to give a streak-free finish to appliances, glass, granite and other work surfaces. Available in four colours (yellow, green, pink and blue). Their most versatile cloth with specialist fibre construction and weave increase the speed at which moisture is absorbed, to remove light grease and finger marks from all shiny surfaces and appliances, to leave them completely streak-free. It will easily outperform specialist liquid cleaners on surfaces like chrome and glass. The Kitchen Whizz is ideal for a quick 'whizz' around the kitchen. Just wet the Whizz under the tap, wring out and clean worktops, hobs and around the sink, all just using water! The extra long fibres reach those hard-to-reach areas under taps and into corners. The dark green scrubbing stripes are made from a more abrasive material to remove stubborn dirt and residue! Washing up is no longer a dreaded chore, whether used with or without washing up liquid, washing up is simple, effective and easy with this pad. The smooth side of the Washing Up Pad easily cuts through grease and grime, using just water, whilst the scrubbing side makes light work of stuck-on food residues and stains. Please note: You must at least follow/like both Unique Young Mum and e-cloth on at least one social media platform! 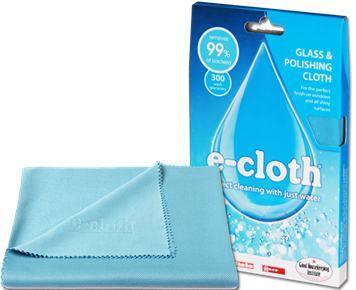 To find out more about e-cloth, and to view their full range of products, check out the official website here.